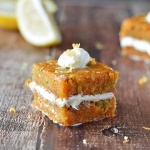 Here is a quick and easy little recipe for Carrot Zucchini Bars with a vegan Citrus Cream Cheese Frosting. There are several companies producing really good vegan cream cheese right now and you can find them in any Whole Foods, Trader Joe’s or similar health food markets. You could also add raisins and/or chopped walnuts to this batter if you’d like. This recipe is for one 8″ cake. It bakes to only about 1/2″ thick, so they are perfect for stacking! We got 8 of them out of this recipe. You could always double it and use a 13″ x 9″ pan if you’d like more or you could also just use one single square and frost it for a reduced calorie bite-sized version. For the cream cheese frosting, we softened some vegan cream cheese and added vegan powdered (confectioner’s) sugar and some lemon zest. You can sweeten this to your liking. The cake itself is not overly sweet. 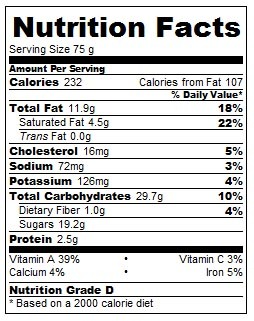 It will however be sweeter if you opt to use applesauce instead of the flax “egg”. Place 4 oz. of vegan Cream Cheese in a bowl to soften while we prepare the cake. In a measuring cup, add 1 Tbl of ground flax seed and 3 Tbl of water. Mix to combine and refrigerate for at least 15 minutes, preferably 30. Line an 8" pan with parchment allowing for some overhang which will aid in removal after baking. Using a box grater, FINELY grate the carrot. Using the other side, shred the zucchini. Using paper towel, squeeze out as much excess moisture as you can from the zucchini. 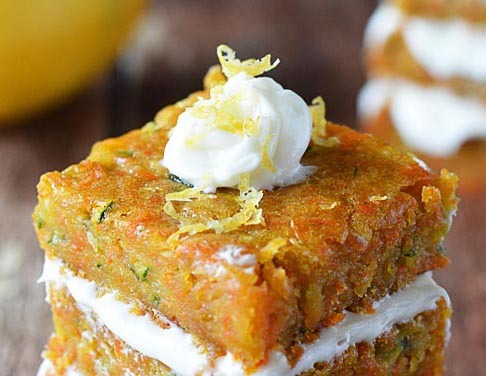 In a large bowl, combine the grated carrots and zucchini along with the rest of the ingredients. Don't forget the flax mixture you have chilling in the refrigerator. Spread evenly into the prepared pan and bake for 20-25 minutes or until golden on the edges and a toothpick inserted comes clean. I would recommend cutting the cake into squares prior to frosting as it can be challenging to cut with the softened cream cheese. This is a moist cake and you'll want to refrigerate after frosting to set as the cream cheese had been softened. 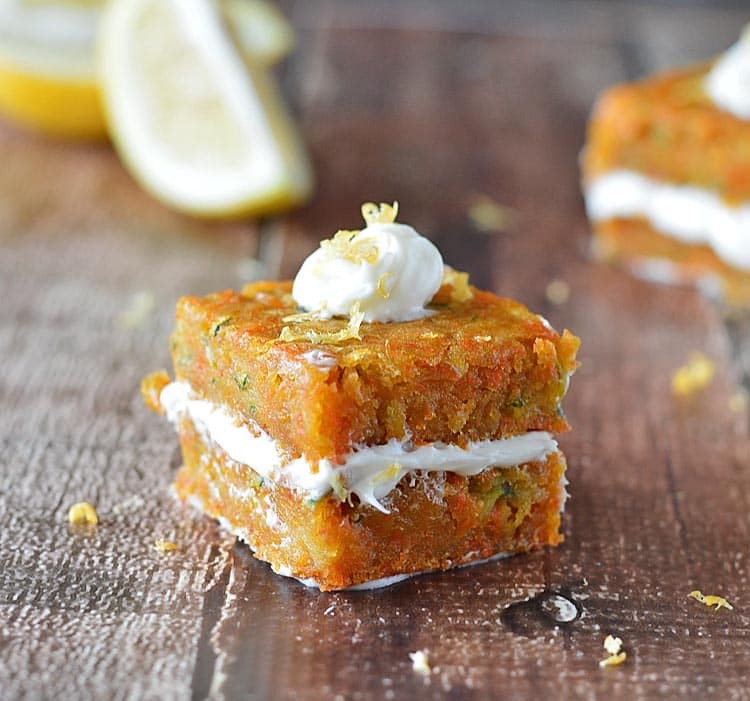 Top with a small dollop of the cream cheese frosting before serving and some fresh lemon zest.